Who doesn't love a water slide? These are the fastest, longest, and most thriling in the world. This waterslide in Beach Park made the Guinness Book of World Records as the world’s tallest waterslide. And it’s not for the faint of heart! At 41 meters high, (the equivalent of 14 stories), brave riders reach 65 miles per hour on the way down. If you can tear your eyes from the drop below, take a look at the stunning views of the Atlantic from the top. The slide is so steep that one Beach Park employee told the Guardian, “you’re in mid-air for most of it.” After all the fear, the ride is only a few seconds before you’re plunged into the pool. Leave it to Disney to create a Blizzard in Florida…with heated water and one of the world’s tallest and fastest water slides. Mount Gushmore on Blizzard Beach, (getting the Disney vibe yet? 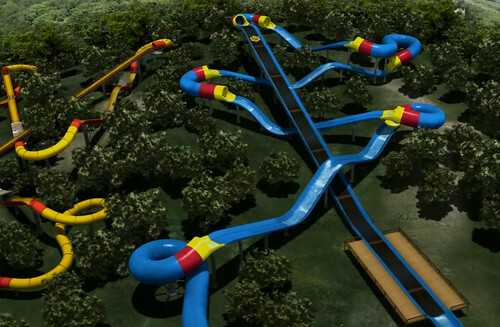 ), is a 12 story peak with the slide starting at 120 feet. Swish through it at 50-60 miles per hour, with a speedometer halfway down to confirm your speed. The world’s longest watercoaster covers 1764 feet, taking you up and down seven stories of climbs and dips. The massive ride begins with a conveyor ride on a raft, carrying you up to the tallest peak before thrusting you on to the ride of your life. It’s no surprise that this waterslide is called the Leap of Faith. Visitors launch themselves onto the vertical drop, starting 60 feet up on top of the Atlantis Mayan Temple, speeding through a clear tunnel, which by the way just happens to be placed in a lagoon filled with sharks. There’s also a challenger slide so you can race your friends, just in case the sharks weren’t adrenaline inducing enough. This is the ultimate water slide. A combination of an intense roller coaster and rushing water. Step into the tiny capsule entrance, close the door, and wait…and wait…until the floor disappears from under you and you drop, plummeting down 10 stories and sliding through the entire ride in less than 10 seconds. It even has a vertical loop, previously seen only on traditional rollercoasters. At more than 500 feet per second, the fear won’t last for long, but waiting in that capsule, it takes a brave soul to not get cold feet. The first waterpark in the world to have a 360 loop on one of its slides, the Terme 3000 adventure pool complex is filled with black thermal water, meaning your plunge into the deep end has some spa benefits. Aside from the full loop, the Aqualoop is the fourth fastest waterslide in Europe, taking less than seven seconds to complete. This water slide is exactly what it sounds like. A swirling, brain joggling trip. The Brain Wash starts with a 53-foot vertical drop, plopping you into a domed funnel where you swirl around amid lights, videos, and sound effects until finally, you rush down six stories and are tossed into the pool. The Surge, Black Hole and Disco H2O are more amazing rides at Wet ‘n Wild. The Galaxy Erding is a haven for water slide junkies. It’s home to 28 of them, divided into three levels of adrenaline. For those who want a real rush, try the Faser, which speeds up to 45 miles per hour. Haven’t had enough? The Kamikaze falls at a gradient of 60 percent. Twin slides Twister and Speedy give you the best of both worlds. Speedy goes really, really fast, (who would have guessed? ), dropping from 460 feet, while Twister is one of the longest indoor slides in the world, and takes you on a dark and dizzy 600 foot long ride.